The audit has also found substantial systemic problems with the Direct Benefit Transfer in LPG scheme, called Pahal by the government. The Modi government has been carrying out a high decibel campaign ‘GiveItUp’, calling upon consumers to give up their LPG subsidies. The Centre claims it would end up saving almost Rs. 22,000 crore in the financial years of 2014-15 and 2015-16 since launching its two-pronged approach on cooking gas subsidy — introducing direct bank transfers of the subsidy and asking better off consumers to voluntarily give up theirs. However, a CAG report to be tabled in Parliament during the ongoing session could seriously puncture the claim, according to reliable sources. The audit has found that the saving from people voluntarily giving up LPG subsidy and direct bank transfers adds up to less than Rs. 2,000 crore. The remaining saving is actually thanks to the dramatic fall in the prices of LPG that India annually imports. The audit has also found substantial systemic problems with the Direct Benefit Transfer in LPG scheme which is called Pahal by the government. Among them are diversion of domestic subsidy for commercial use and commercial consumption LPG being diverted to domestic use. The Modi government has been carrying out a high decibel campaign ‘GiveItUp’, calling upon consumers to give up their LPG subsidies. Coupled with the direct bank transfers, the saving has been almost Rs. 22,000 crore, the government claims. Under the DBTL scheme, rolled out in November 2014, cooking gas subsidy is transferred directly to the bank accounts of beneficiaries to cut down on wastages. “If DBTL was not there, the government would have had to spend around Rs 15,000 crore more in 2014-15,” Petroleum Minister Dharmendra Pradhan said at a recent seminar on energy subsidies. From the ramparts of Red Fort in 2015, Prime Minister Narendra Modi claimed that India has saved Rs 15,000 crore annually in subsidy outgo for cooking gas thanks to DBTL and GiveItUp campaign. “We got the LPG gas subsidy under direct cash benefit transfer. We used the Jan Dhan Yojana and Aadhar cards. Because of this, middlemen and black marketers have been hit. We corrected the system and Rs 15,000 crore, which was stolen every year in the name of gas subsidy, has been saved," Modi said, addressing the nation from the Red Fort. The reality, however, may be far from what the government has been touting, according to the CAG report to be tabled in Parliament during the ongoing monsoon session. According to dependable sources, the huge drop in subsidy budget is mostly due to the dramatic drop in the global price of LPG that India imports. 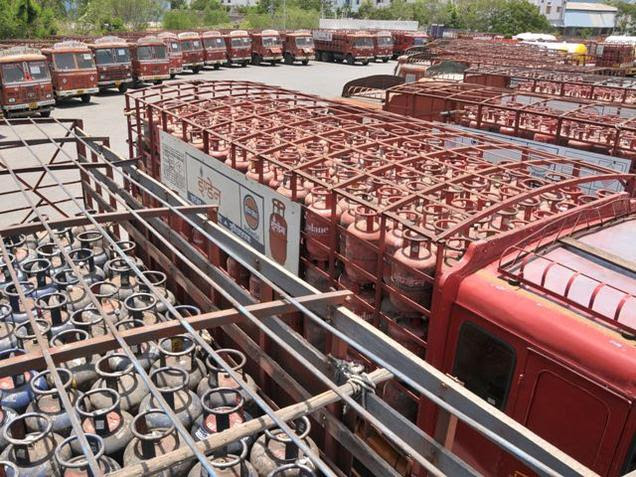 According to the Petroleum Planning and Analysis Cell (PPAC) of the government, India saw the value of its LPG imports drop from Rs 36,571 crore in 2014-15 to a projected Rs 25,626 crore in 2015-16. That is a saving of Rs 10,945 crore in just a year. PPAC data also shows that the LPG imported has actually gone up in that period—from 8,313 thousand metric tonnes (TMT) in 2014-15 to 8,885 TMT in 2015-16. “FOB (Free on Board) of LPG is weighted average of Saudi Aramco contract price (CP) for Butane (60 per cent) and Propane (40 per cent) for the previous month and also includes daily quotes of premium/discount averaged for the previous month,” the PPAC said. The price of Butane fell from $825 per metric tonne (MT) in May 2014 to $310 per MT in July 2016. The price of Propane fell similarly, from $810 per MT in May 2014 to $295 per MT in July 2016.